Home / Adviart Blog / Instigate with kindness. Instigate with kindness. The adviarter picked this purple shell and used purple to sync with the colors on my nails. The words are written in all caps across the shell. Ironically, the adviarter had a shell on his desk that was painted by a child of one of his mentees (it was painted in various colors). The idea of instigating with kindness coming after a long discussion on dissertation research, religion, science, and education. The initial conversation focused on “the answer is in the room.” The motivation for this thought process being that a leader (educator) looks to bring out the answers that are already in the space–this assumes that the class/group of folks in a session are filled with the ideas to make progress happen in any given domain. I believe it also speaks to the ability to obtain acceptance for a new idea and moving forward with that idea. The conversation moved to thinking about whether or not we should take advice at all–or should we trust what we know in our own minds/hearts. Instigating with kindness is a great summary of the approach that I would like to take as I move forward in my career and personal pursuits. As a person who likes “change” and to seemingly ruffle feathers when warranted, I find instigating a natural characteristic in my behaviors. When instigating with kindness, we can diffuse a situation quickly and get to a resolution of change versus putting people on the defense. This advice reminded me of the idea in hospitality where we “kill ‘em with kindness” when dealing with a customer who might be a bit difficult. Point being, regardless of the difficulty of a situation, we can make a choice to be kind. 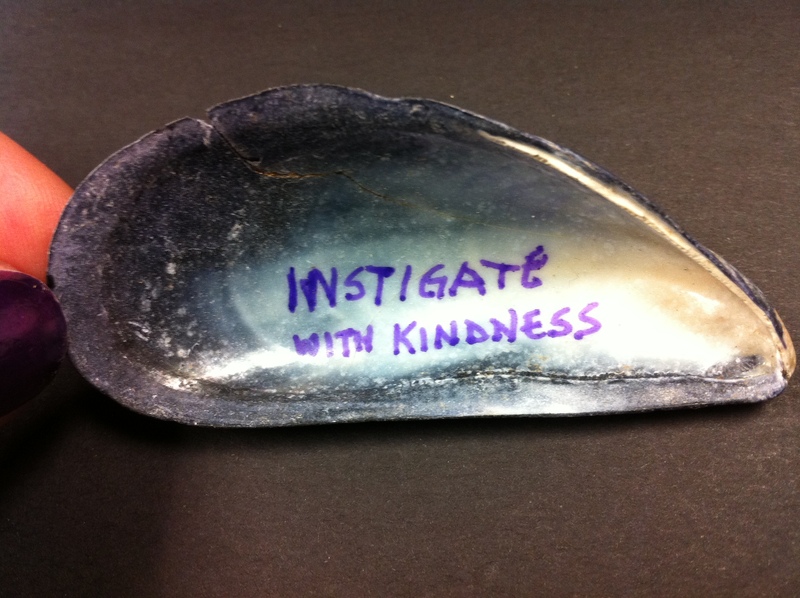 IWK (instigate with kindness) might just be a huge method of focus for 2012 and beyond. The question that I ask myself now is how we ensure that the kindness is always a part of what we are working on and how we can consciously instigate with good intentions on a consistent basis.